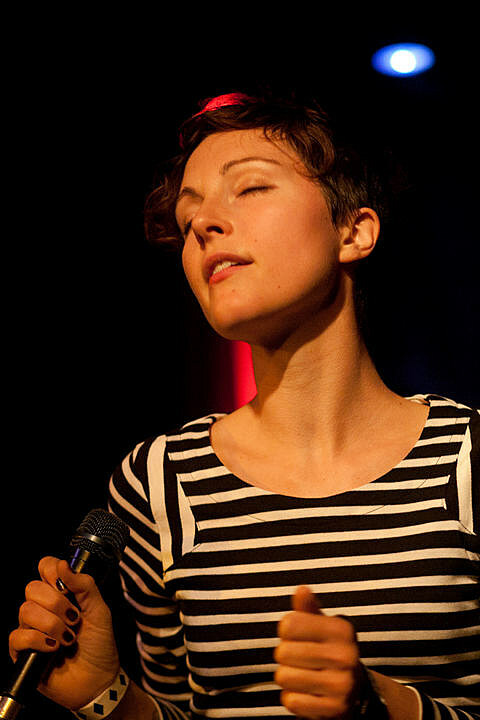 Polica, the current project of Channy Casselle of Gayngs, made quite an impression at the BV day party at Public Assembly on Saturday (10/22). Channy danced breezily on stage as she belted out her intricate vocals with an on-stage presence ambitious enough to fill arenas, let alone the back room of Public Assembly. She was backed by two drummers, a bassist, and some samples. I knew that the Polica album was beat-heavy but I was not at all expecting to see the interlocking percussion that the drummers provided. At times they would add to each others rhythms with complementary parts, at others they’d provide parallel executions of the same pattern by using different parts of the kit, and they also gave each other the chance to throw in fills without sacrificing the beat. As we’ve also pointed out previously on BrooklynVegan, Polica “will release their debut LP, Give You the Ghost, on February 14 via Totally Gross National Project” and the band has many live dates scheduled over the next few months including one in Austin on 2/24 at Mohawk with their Minneapolis friends (and fellow Gayngs members) Marijuana Deathsquads. Advanced tickets aren’t on sale (yet? ).